love, ink: International Inkers Debut!! Well, I'm a tad late on my posting, (we've been busy painting all weekened), but here it is!! Welcome to the first posting from a little group we're calling INTERNATIONAL INKERS! I was invited by a few of my very talented stamping friends from accross the border and overseas to join short little monthly kit share. Each month we are sending identical kits to each inker. There are 6 of us. 2 each from Canada, the US, and Germany! How fun is that??! Once each of us recieves the kit, we will create a project and post it on our blogs! As an added bit of fun, you can leave a comment on each of our blogs and one lucky poster will recieve the identical kit! (drawn randomly). Well, there it is! My meager contribution to this talented group! I loved the adorable animals in the kit, and what wonderful companions they make! I colored them with my copics in Cool Grey #3 and #5. I thought it appropriate to cut out the layers for the dog and cat a bit crooked, just for the fun aspect of the images. They screamed for something abstract! I also settled on using the paper with the foiled design on it because robots make me think of metallic things! I popped them up on dots just to have them pop off the card a bit. 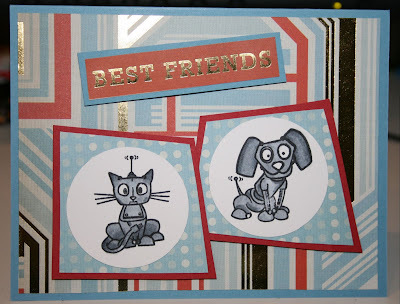 I cut out the BEST FRIENDS sentiment from a sheet of the papers that were included, and i think the purrrrr-fect sentiment for the inside would be ..... "cuz opposites attract"..... what do you think? I'm looking at your creativity and its wonderful, Paola advised me to come and look. Love it. I love this card, wonderful shapes and the papers add to that. Very creative. Poala sent me along to your blog. aww Karen, this is sooo totally adorably sweeettttttt!! I love the card. Its put together so great. Just love the Best friends and the metallic shine to it. Wonderful job. Karen, it´s a fun card. I like the shini sentiment and your layout is great. I´´m looking forward to next month. Stopping by via Paola's blog. I really like the cat and dog idea you used on the card. Great job! Oh this is just too fun! I love the "non square" cut outs for the animals - just to perfect. And another great thought of cutting out the metallic words. So creative my friends are (I am stealing that idea - LOL). Thanks for joining us Karen. I am so excited by this fun venture and I can't wait to see next months! Kare-bear! I just love the abstract shapes you used to mat the adorable dog & cat! Your coloring looks great and because it's not overly froo-froo, this would totally work for a boy/masculine card. Great job! Oh how fun! I'm glad to see your creations again, my sweet friend! I love the grey-scale images against the patterned paper and the fun shapes you've used! Yay for fun friends and card kits! 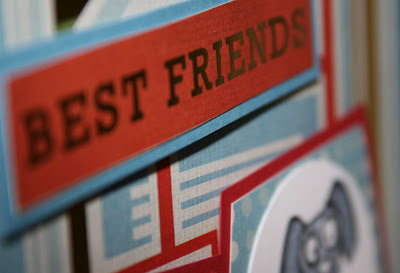 Love your sweet and fun friend card! What adorable little robot animals! I love this card! I love the robot animals. great idea !!! I would be happy to participate!!! Adorable card!!! I just love the friends,These are looking cute.. This card is looking cute and funny..